The Nexxt Cloud feature, along with the mobile application, provides live router status along with the ease of remote management from your smartphone, tablet or computer. This state-of-the-art router supports the latest in IPTV technology, allowing you to receive your television service through the internet. Incorporated bandwidth control prioritizes traffic to bandwidth intensive applications like HD streaming and important file sharing. Guest networks can be conveniently setup in order to segment and protect your personal network. The Nebula1200 AC has been designed to keep up with the modern day demand of homes and small offices. Nexxt Solutions, a US Company committed to Quality and Customer Service with over 10 Million products shipped since 2003. Please Click above in 'Sold by NexxtSolutions' for customer support contact and FAQ on help with installations. 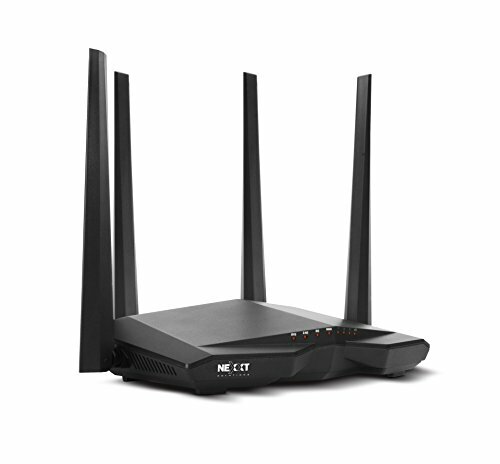 4 Antenna allow Amplifying Signals for Superior signal reach, Supports 802.11ac the New Generation of Wi-FI Dozens of Times Faster than N Speeds, and still works with N150,N300,N600,N750. If you have any questions about this product by Nexxt Solutions, contact us by completing and submitting the form below. If you are looking for a specif part number, please include it with your message.